Ugh. Do we really need another charades game? 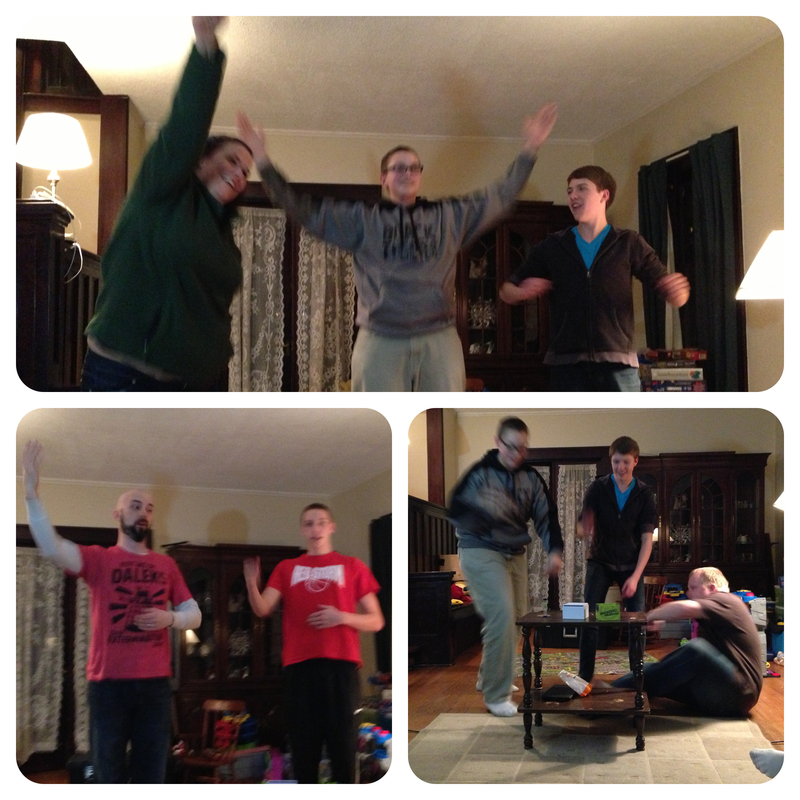 Reverse charades is like charades…in reverse. Instead of one person trying to get multiple people to guess a word or phrase, Reverse Charades is multiple people trying to get one person to guess a word or phrase. And it’s a ton of fun. 1 set of rules—the easiest, simplest rules card we’ve seen in a long time. (top) Football (bottom left) Phantom of the Opera (bottom right) ??? Players are divided into teams of at least 3 or more players. When it’s a team’s turn they choose someone to be the lone guesser and the rest of the entire team takes the stage! The other team then holds the cards and reveals one at a time so only the actors can see them, and then the zaniness commences! The team of actors has to act out as many of the clues as they can, scoring a point for each card they get the guesser to correctly guess. The one strict rule in the game is that you can not make a sound, you can’t mouth words to another actor, or to the guesser. But you are certainly allowed to use objects, and people as objects, to get the guesser to shout out the word(s) on the card! Play continues until a point goal is reached, or until everyone is laughing too hard and can’t go on any further! Jeremiah—We really enjoyed playing this game; we had some teenagers over and I busted it out—what a hoot! It takes about 45 seconds to explain, and we had some great laughs. Jeremiah—If there’s one downside to the game it’s that it requires a larger group (at least 6 people or more) to get a game going. And that’s not much of a downside, it’s just the nature of how the game works. Anything less and it’s just plain old Charades. Jeremiah—I love that there are a ton of words/cards included, I’m very interested in checking out the expansions. (Especially the holiday edition! I think this would be a great game for a Christmas party!) I will say that the best and most fun clues were ones that required a team effort. Things like clothesline, assembly line, etc. Jeremiah—The concept is such a simple twist on (what I feel is) something that is kind of worn out. But that twist makes it about a million times more fun than the original. We found that folks who wouldn’t normally feel comfortable playing charades in a traditional format—getting up by themselves and feeling singled out—jumped right up when there were other victims involved in the public ridicule! Firestone—Being alone up there giving clues can be terrifying. Being in a group somehow makes it way easier. One of the quietest people in the group dove right in and was hamming it up. Jeremiah Final Thoughts – We had a TON of fun playing this game! It definitely takes a party atmosphere to get it going; it’s not your typical Board Game Night type of game. This is a top-notch party game, a very well done spin on something that has been public domain for some time. 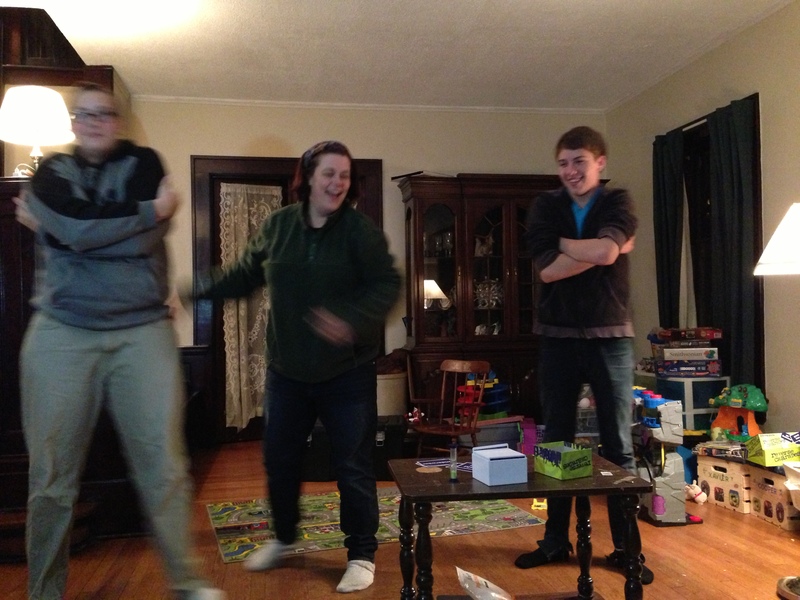 Reverse Charades will be a part of my party game collection and find its way out to many parties and large gatherings! Firestone Final Thoughts—This is definitely going to every party with me for the foreseeable future. Everyone had a blast, and we laughed A LOT. If you’re sick of Apples To Apples and Scattergories, give Reverse Charades a try; you won’t be disappointed—unless you’re at the bottom of “Dog Pile.” Ouch! Thanks to Gryphon Games for providing review copies; this in no way affected our opinions on the game. Thanks to you for reading!